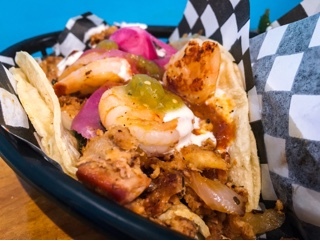 Seven Lives Tacos Y Mariscos’s tacos have been haunting me ever since I’ve first tried them about a year and a half ago. 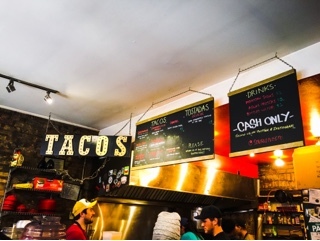 On this return visit, nothing has changed: the small restaurant is as busy as ever, eating in is still limited to a table of six and standing room for about the same, but most importantly, the tacos are still $5 each and just as delicious as ever. Diners rave about the Gobinator ($5), a rare combination of smoked tuna, shrimp and cheese. It’s never sounded appealing to me, but with this much praise it’s at least worth a try. You have to like the idea of smoked tuna - are you the type of person that salivates at the site of a Scandinavian herring platter? Then this one’s for you. As for me, the fish was simply too overpowering that even the pickled red onions couldn’t counterbalance it. It wasn’t bad, but give the simple spicy shrimp taco any day. 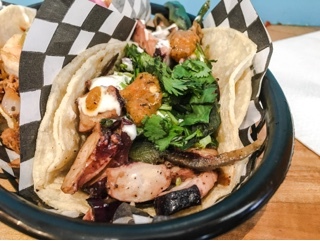 The grilled octopus ($5), on the other hand, will fast become a go-to taco. The tendrils were cut into little discs and reheated on the flat top so they arrive smoking hot with a tender chew. The sautéed peppers and abundance of fresh cilantro worked well with the meaty seafood, with drizzles of sour cream to tie it all together. 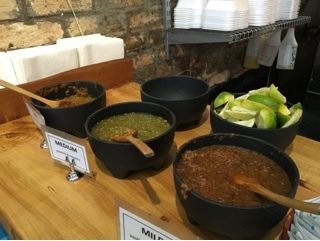 Seven Lives has a great selection of house made salsas. The hot habanero one seems to be the most popular, but trust me it's SPICY. If you don't like the sting, the medium version has the kick of jalapeno with acidic tomatillos to mellow it out. Even with double soft corn tortilla shells things are bound to get messy as each taco is overflowing with toppings. So grab a few wet naps and wear a dark shirt. For such affordable eats packed with delectable ingredients and flavours, sticky hands and a messy shirt are worth it.